The first event for Conflict, "Ballista," has been introduced. As of this update, Ballista will be run as several stand-alone events. It is scheduled to become a permanent feature at a later date. New quests and battles designed for alliances have been added. New quests are available in most nations. Guild quests that call for the manufacture of certain items have been implemented. New NPCs have appeared in each guild to offer the quest to characters who have the required rank and skill level in the appropriate craft. Players will now be able to participate in an event called "Garrison" at several of the outposts. A specific item must be traded to the guard in order to begin the event, and then a level restriction will be imposed depending on the location of the outpost. A new low-level quest to obtain the pact for summoning avatars has been implemented. The amount of gil required to change titles has been reduced. New Dynamis field areas have become accessible. Certain conditions must be fulfilled in order to reserve and enter the two new areas. Additional monsters have been placed in the four existing areas of Dynamis. Characteristics such as names and behavior have also been changed for some of the monsters in these areas. Two new orb battles have been introduced. The level restrictions for the orbs are 20 and 30 respectively, with the number of characters able to enter the battlefield limited to three for both orbs. The moon orb (obtained by trading 60 beastmen's seals) can now be used at the Qu'Bia Arena shimmering circle. An issue concerning the accumulation of TP with weapon skills that consist of multiple strikes (i.e. Combo, Penta Thrust, etc.) has been corrected. TP will be accumulated as usual for that weapon type on the first strike (first two strikes for hand-to-hand attacks or when wielding two weapons), with each subsequent strike accumulating 1 TP. Accordingly, enemies who are the targets of multiple-strike weapon skills will only gain TP from the first strike (first two strikes for hand-to-hand attacks or when wielding two weapons). Also, all elemental weapon skills, except for Starlight and Moonlight (which affect only the wielder or party members), will now accumulate TP when used. A new job trait called "Subtle Blow" has become available to ninja and monks. This ability reduces the amount of TP gained by enemies when striking them. 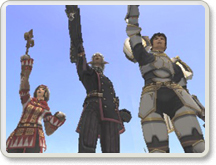 A new job ability called "Spirit Link" has become available to dragoons. This ability enables dragoons to sacrifice their own hit points to heal their wyverns. Also, if a wyvern at full HP is sent away using the "Dismiss" command, the "Call Wyvern" ability will be available for use immediately. The mysterious "Strange Apparatuses" have become operational. A new flowerpot known as the "Arcane Flowerpot" has been added. Players will be able to insert their names in the help text of certain items they synthesize by using the crystals listed below. This signature will remain with the item when it is traded, bought from a bazaar, or sent to a player (including deliveries from the Auction House), but will be lost if purchased directly from the Auction House. It is possible to see if an item is signed when making purchases from a bazaar. Also, when perusing a bazaar, other information such as the Dynamis reservation time of the perpetual hourglass and the size of fish obtained through fishing will now be visible. New guild-related furniture and equipment have been added. The number of items obtained from beastmen treasure caskets has been increased. New synthesis and desynthesis recipes have become available. New items have become available for purchase at several of the guild shops. Various other new items have been added. The woodworking recipe for making "bookshelves" has been adjusted. The skill level required to synthesize this item has been lowered accordingly. An issue where attempts to synthesize a pair of Cursed Breeches resulted in an incorrect high-quality item has been addressed. 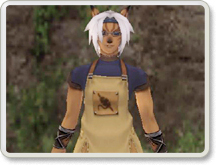 Fenrir Stone "Delay:276" --> "Delay:999"
/hurray Give a triumphant cry. /toss Perform the action of tossing an object. A new text command "/recast" has been added that displays the time remaining until a spell, etc. can be reused. A sort function has been added to the Storage menu. A character's footsteps will no longer be heard when using Sneak. The name of a pet's master will be displayed when a pet is targeted. The limit for the /wait macro has been extended to sixty seconds. An ON/OFF setting for "Effects" has been added to the Config menu. It is now possible to place single items on auction directly from an incomplete stack of items. When typing in the input window, the cursor can now be shifted to the start or end of the line by pressing the Home or End keys. The camera view is now adjustable when using the Layout function of the Mog House. An issue concerning the consistent reappearance of the "!" mark on the Moghancements key item has been addressed. The help text of the key item Moghancement: Experience, which stated that the item did not have any effect on Raise spells, has been corrected. 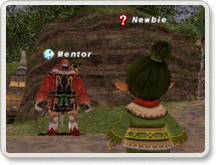 A new system called "Mentor" that allows veteran adventurers to assist new players has been implemented. Characters below level 5 and with less than 5 hours of play time will automatically gain "New Adventurer" status, signified by an icon displayed next to the character's name. The New Adventurer icon can be removed by selecting "Cancel New Adventurer Status" under Config in the Help Desk menu. Please be advised that once New Adventurer Status has been canceled, it cannot be reinstated. The category "Key Item" has been added to the auto-translate function.